This was the subject addressed by researcher Peter Stevens at the Society’s first meeting of a new season. The RAF station at Balderton, active during the Second World War and for most of the following decade, is no longer in existence. The site lies off the old Great North Road, two miles to the south of Newark. Prior to 1939, when the land was pronounced available by the ministry, the area had been occupied by three farms. For the community was still very much a rural one. Balderton was, characteristically, a rural village surrounded by farms and countryside, detached from Newark town by a green belt area. Beyond that village lay the historic road to London and the south. This latter highway passed through Newark centre as it took its path through the country. In 1964, as the volume of through traffic increased dramatically, what was then called the A1 road was diverted to the east of the town by the building of a dual carriageway link, the ?Newark bypass'. This new stretch of road was laid over the Balderton airfield site, by then discarded. But let the reader go back almost eighty years. Initially, RAF Balderton opened in June 1941 to operate as a satellite station for Finningley and Syerston. It was used for the flying of Hampdens and Wellingtons, previously stationed at RAF Hucknall, and occasionally Manchesters from 9th December of that year. The facilities lacked permanence, for there were no sturdy buildings, and the runways were of grass. Indeed, one Hampden bomber was involved in a tragic accident, causing it to crash into houses with the loss of three infant lives. The harsh winter of 1941–1942 created dangers to take-off and landing. On 19th September of the following year, the station was made dormant for a time in order for the base to be properly established. Station buildings were erected and a concrete runway laid. 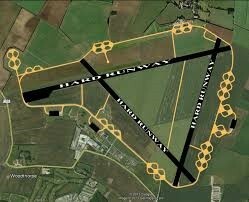 RAF Balderton was made into a technical site for RAF operations. Then, in August 1943, a conversion unit (1668 unit) was formed, and the airfield broadened its scope to fly Lancaster bombers. 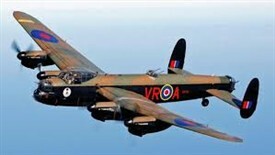 Lancasters were well-known in the many local aerodromes of the Trent Valley. Soon afterwards, the RAF property was expanded outwards to line nearby roads such as Hollodyke Lane and Shire Lane, and hangars were built. Heavy glider maintenance began, lasting until April 1944. See the report on RAF Syerston, an address given by Tim O’Brien, dated 19th September 2015, in the NALHS file. See earlier note in the first paragraph of this report. This page was added by ROGER PEACOCK on 30/11/2017.